So, today I gave blood, and they were all 'Anyone type-B or type-O?' and I was all 'O-neg FTW!' and they were all 'Great, go there' and I did, and I gave double red. Conscription. I'm down with that. Anyway, because I gave double red, I got a groovy Red Cross baseball hat. 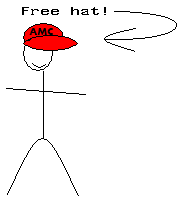 So I can wear it and advertise the Red Cross and people will see me wearing my cool hat and think, 'Oh, look, he must be trying to hide the fact that he's going bald' and then they'll think 'OMG, Luca's in chemo!' 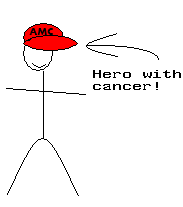 and I'll be branded a hero, because people with cancer are heroes. 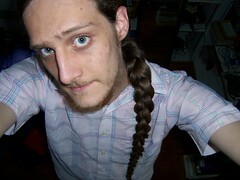 Only, I don't have cancer and I'm not going bald. But I gave blood doubly, so I am a hero. Props to me. I also got cookies. 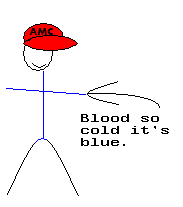 Anyway, because I gave double red, which means they put the plasma back in, and it was cold. Normally, I'm fine walking around in sub-zero (C) temperatures in short-sleeved shirts, but that's because I'm warm and the outside is cold. Here, outside was meh and inside I had cold blood flowing through my veins. While I 'drank' the ice from my orange juice. So next time I'll dress more warmly.